Oakland Police Chief Anne Kirkpatrick at a press conference with Mayor Libby Schaaf. 2. With the rental housing crisis hitting Hayward with full force, the city council unanimously approved an emergency just-cause ordinance to shore up roughly 7,000 units, including single-family home rentals, that did not previously have the protections under the current ordinance, the East Bay Citizen reports. Some city leaders worried landlords would raise rents and evict tenants while the city works on amendments to its rent stabilization ordinance coming this summer. 3. A U.S. District judge ruled against the Trump administration’s push for inclusion of a citizenship question on the upcoming 2020 U.S. Census, citing the request as unconstitutional, The Hill reports. The lawsuit was led by California Attorney General Xavier Becerra. 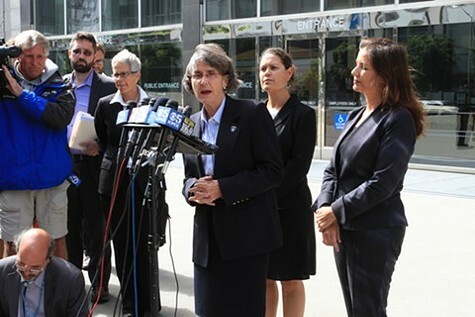 Oakland and Fremont were two of the cities that offered support for the lawsuit. 4. The Raiders return to Oakland for at least one more year is again on shaky ground, David DeBolt of the East Bay Times tweeted. 5. More on the Raiders: Veteran NFL reporter Jason Cole writes in Fansided that the league is showing great apprehension toward Raiders owner Mark Davis’s handling of the stadium situation and other instances of ineptitude. The article highlights a long-rumored belief that NFL owners will one day attempt to force Davis to sell the team. 6. Alameda is believed to be the first city council in the state to approve a resolution in support of AB 31, the 'no tampon tax' bill currently being debated in the state Legislature, the East Bay Citizen reports. 7. The kids are doing alright. Three Oakland girls high school basketball teams heading to the state finals this weekend in Sacramento. OAK-LAND! OAK-LAND! OAK-LAND! Three Oakland girls teams all going to the state basketball championships. Congratulations Bishop O’Dowd (D1), Oakland (D3) and Oakland Tech (D4) after winning NorCal titles. 8. Tuition for in-state University of California undergrads will remain flat, KTVU reports. It's the seventh time in the last eight years that tuition has been unchanged. The last increase was 2017.